Definitely not a landscape. Not even taken outdoors, although the leaf and snail came from there originally. One thing I learned about snails on this shoot is that their eyes are the black dots at the end of the antennae. Cool! Another ribbon! Just when I was thinking I'd never win another. Thanks, everyone! This was a studio shot. I taped a leaf over the top of a lens hood and collected a bucket of snails from the garden. Very little post processing, just a bit of vignetting both top and bottom, and turned the saturation up to 11. Whats really great about this shot is that you have the colors and the setup of a landscape; even a nice object positioned there. Very well done, Nice work. Congrats on getting the Yellow. Congratulations Ann on your great finish. This is a wonderful macro. Awesome! 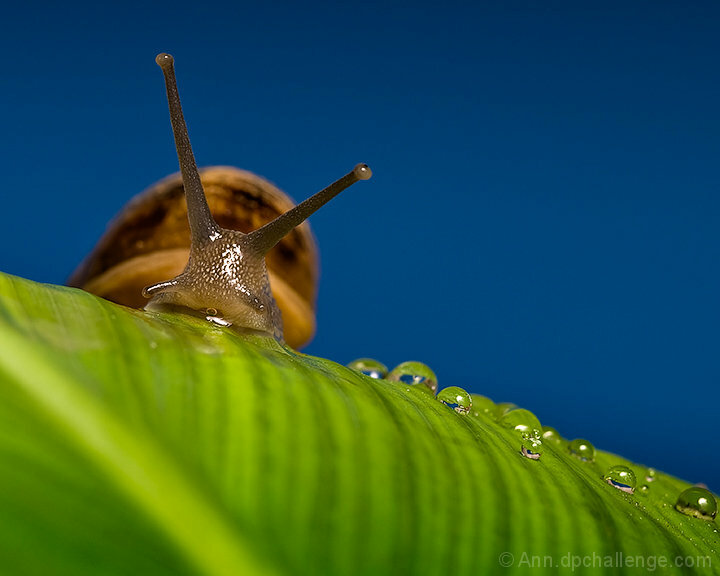 That is a flawless macro, and a snail is a great subject that you don't see every day. CONGRATULATIONS! congrats on the ribbon with this great macro shot!! Great shot. Also, if you've never seen over the top with sylverster stalone....oh man, go see it. Great shot, Ann. Glad it did so well for you. Big congrats on your ribbon. I like the Snail and the water droplets add to the composition. Top notch macro shot. Great details. Love the background, the leaf and the droplets. Composition cannot get any better than this, I suppose. My favourite here. Great job, very interesting picture!!! Tremendous picture - great detail and colour. The blue could possibly have been a little punchier, but it really isn't an issue. Very cool shot. Technically perfect. Great colors. And best of all, a different subject that you don't see much of on this site. What a cool POV, great colours too. razor sharp, really nice blend of colors. This may well be my favorite. I love the colors/contrast, and it feels like its clear and blurred in all the right places. :) An all-around great photo. Jason?? Man, I hate slugs.. but this on is very appealing to the eye. remarkable. Proudly hosted by Sargasso Networks. Current Server Time: 04/22/2019 11:59:47 AM EDT.